The 3rd Marine Aircraft Wing's mission is to provide combat ready expeditionary aviation forces capable of short notice world wide deployment to Marine Air Ground Task Force (MAGTF), fleet and unified commanders. Marine Medium Tiltrotor Squadron 161 (VMM-161) is a United States Marine Corps transport squadron consisting of MV-22 Osprey tiltrotor aircraft. 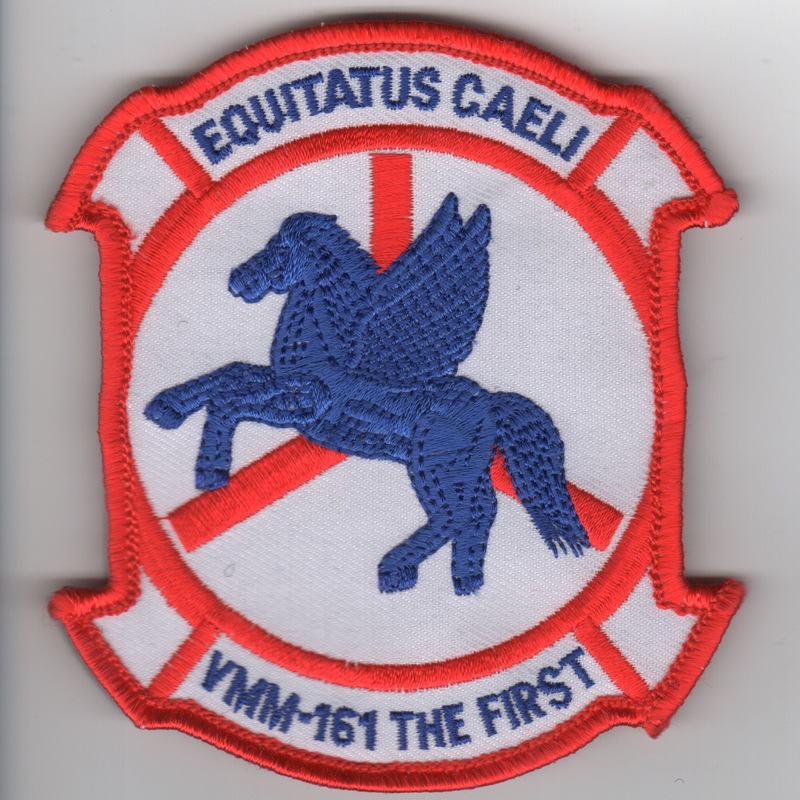 The squadron, known as the "Greyhawks", is based at Marine Corps Air Station Miramar, California and falls under the command of Marine Aircraft Group 16 (MAG-16) and the 3rd Marine Aircraft Wing (3rd MAW). The squadron has the distinction of being the first helicopter transport squadron in the world. This patch comes with velcro attached. Marine Medium Tiltrotor Squadron 162 (VMM-162) is a United States Marine Corps tiltrotor squadron consisting of MV-22 Osprey transport aircraft. The squadron, known as the "Golden Eagles", is based at MCAS New River, NC and falls under the command of Marine Aircraft Group 26 (MAG-26) and the 2nd Marine Aircraft Wing (2nd MAW). HMM-162 officially stood down December 9, 2005 to begin the process of transitioning to the MV-22 Osprey. On August 31, 2006, the squadron was reactivated as the second operational Osprey squadron in the Marine Corps. This is one (of nine) of their detachment patches created that says "SHITTER PILOT" along the bottom, and does not comes with velcro attached. Marine Medium Tiltrotor Squadron 162 (VMM-162) is a United States Marine Corps tiltrotor squadron consisting of MV-22 Osprey transport aircraft. The squadron, known as the "Golden Eagles", is based at MCAS New River, NC and falls under the command of Marine Aircraft Group 26 (MAG-26) and the 2nd Marine Aircraft Wing (2nd MAW). HMM-162 officially stood down December 9, 2005 to begin the process of transitioning to the MV-22 Osprey. On August 31, 2006, the squadron was reactivated as the second operational Osprey squadron in the Marine Corps. 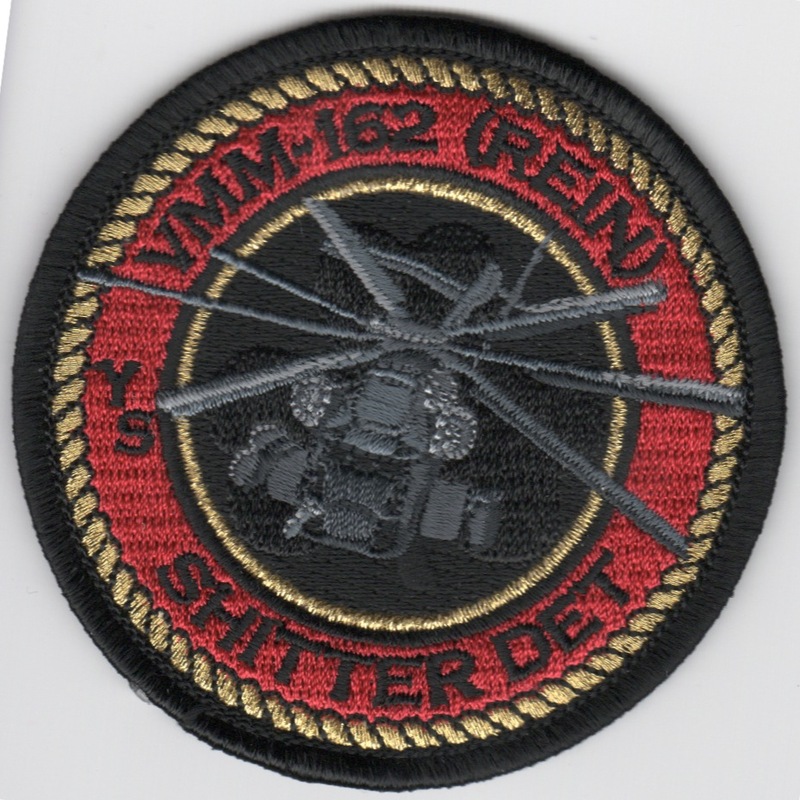 This is one (of nine) of their detachment patches created that says "SHITTER DET" along the bottom, and does not comes with velcro attached. Marine Medium Tiltrotor Squadron 162 (VMM-162) is a United States Marine Corps tiltrotor squadron consisting of MV-22 Osprey transport aircraft. The squadron, known as the "Golden Eagles", is based at MCAS New River, NC and falls under the command of Marine Aircraft Group 26 (MAG-26) and the 2nd Marine Aircraft Wing (2nd MAW). HMM-162 officially stood down December 9, 2005 to begin the process of transitioning to the MV-22 Osprey. On August 31, 2006, the squadron was reactivated as the second operational Osprey squadron in the Marine Corps. This is one (of nine) of their detachment patches created that says "SHITTER CDI" along the bottom, and does not comes with velcro attached. Marine Medium Tiltrotor Squadron 162 (VMM-162) is a United States Marine Corps tiltrotor squadron consisting of MV-22 Osprey transport aircraft. The squadron, known as the "Golden Eagles", is based at MCAS New River, NC and falls under the command of Marine Aircraft Group 26 (MAG-26) and the 2nd Marine Aircraft Wing (2nd MAW). HMM-162 officially stood down December 9, 2005 to begin the process of transitioning to the MV-22 Osprey. On August 31, 2006, the squadron was reactivated as the second operational Osprey squadron in the Marine Corps. 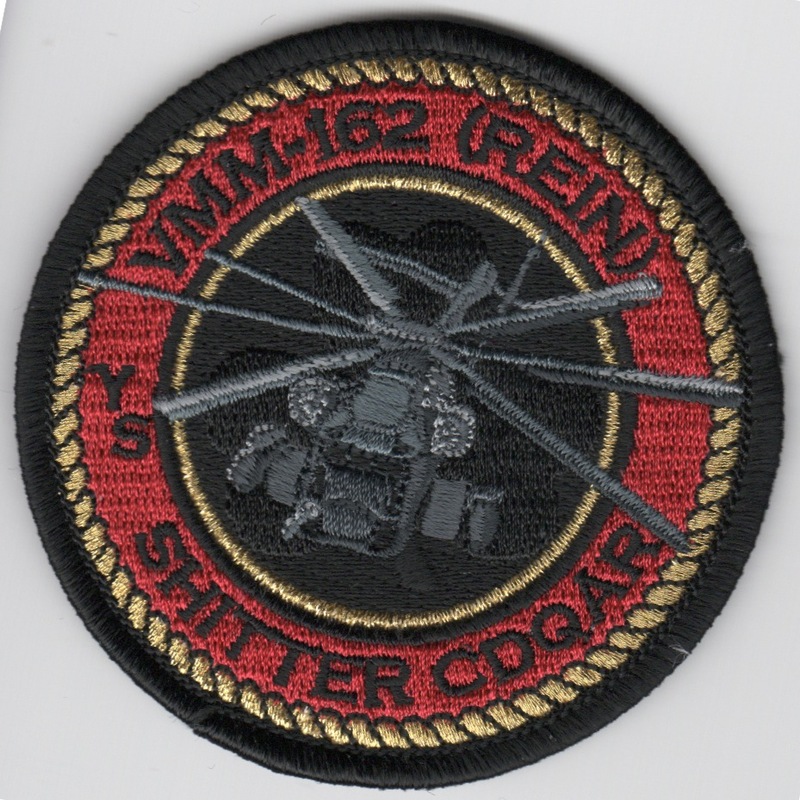 This is one (of nine) of their detachment patches created that says "SHITTER CDQAR" along the bottom, and does not comes with velcro attached. Marine Medium Tiltrotor Squadron 162 (VMM-162) is a United States Marine Corps tiltrotor squadron consisting of MV-22 Osprey transport aircraft. The squadron, known as the "Golden Eagles", is based at MCAS New River, NC and falls under the command of Marine Aircraft Group 26 (MAG-26) and the 2nd Marine Aircraft Wing (2nd MAW). HMM-162 officially stood down December 9, 2005 to begin the process of transitioning to the MV-22 Osprey. On August 31, 2006, the squadron was reactivated as the second operational Osprey squadron in the Marine Corps. 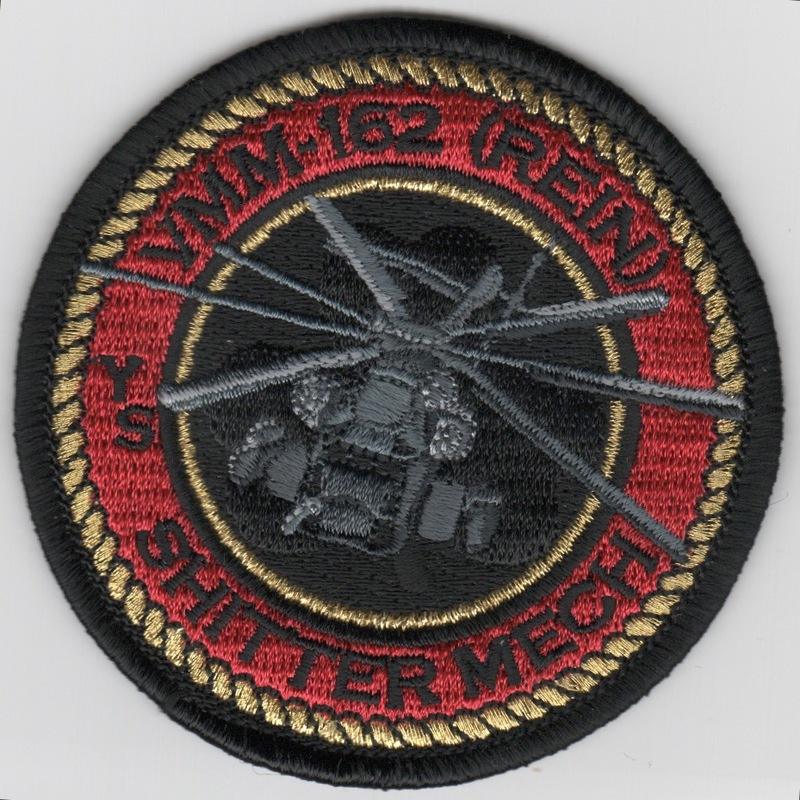 This is one (of nine) of their detachment patches created that says "SHITTER MECH" along the bottom, and does not comes with velcro attached. Marine Medium Tiltrotor Squadron 162 (VMM-162) is a United States Marine Corps tiltrotor squadron consisting of MV-22 Osprey transport aircraft. The squadron, known as the "Golden Eagles", is based at MCAS New River, NC and falls under the command of Marine Aircraft Group 26 (MAG-26) and the 2nd Marine Aircraft Wing (2nd MAW). HMM-162 officially stood down December 9, 2005 to begin the process of transitioning to the MV-22 Osprey. On August 31, 2006, the squadron was reactivated as the second operational Osprey squadron in the Marine Corps. 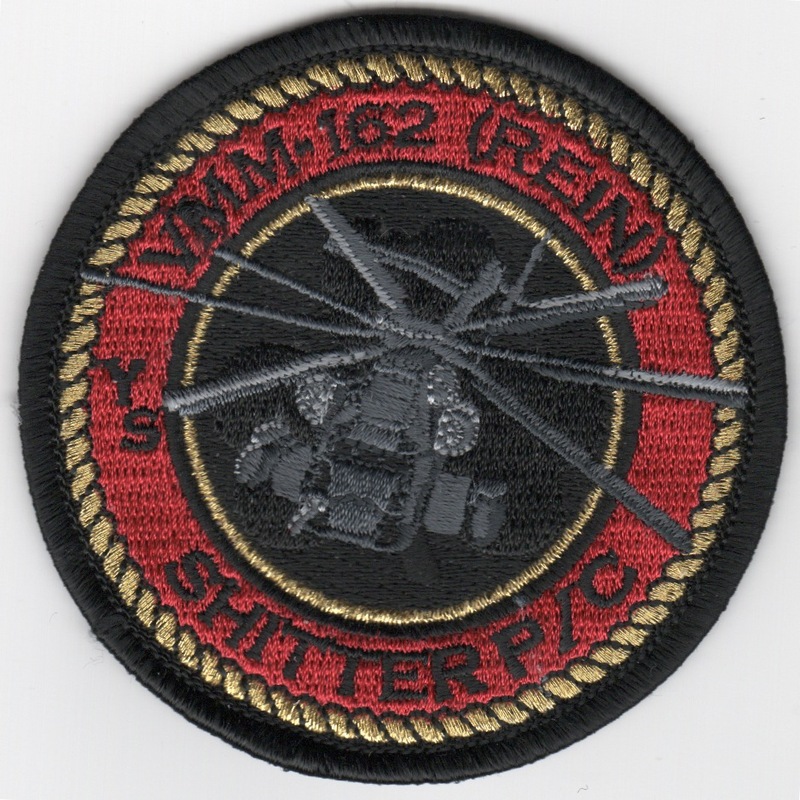 This is one (of nine) of their detachment patches created that says "SHITTER P/C" along the bottom, and does not comes with velcro attached. Marine Medium Tiltrotor Squadron 162 (VMM-162) is a United States Marine Corps tiltrotor squadron consisting of MV-22 Osprey transport aircraft. The squadron, known as the "Golden Eagles", is based at MCAS New River, NC and falls under the command of Marine Aircraft Group 26 (MAG-26) and the 2nd Marine Aircraft Wing (2nd MAW). HMM-162 officially stood down December 9, 2005 to begin the process of transitioning to the MV-22 Osprey. On August 31, 2006, the squadron was reactivated as the second operational Osprey squadron in the Marine Corps. 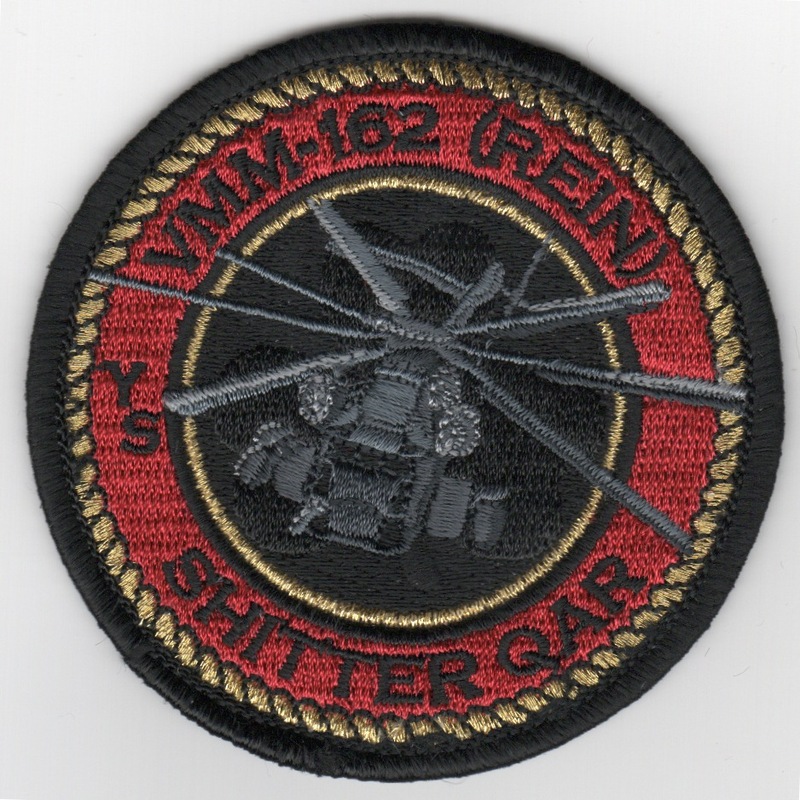 This is one (of nine) of their detachment patches created that says "SHITTER QAR" along the bottom, and does not comes with velcro attached. Marine Medium Tiltrotor Squadron 162 (VMM-162) is a United States Marine Corps tiltrotor squadron consisting of MV-22 Osprey transport aircraft. The squadron, known as the "Golden Eagles", is based at MCAS New River, NC and falls under the command of Marine Aircraft Group 26 (MAG-26) and the 2nd Marine Aircraft Wing (2nd MAW). HMM-162 officially stood down December 9, 2005 to begin the process of transitioning to the MV-22 Osprey. On August 31, 2006, the squadron was reactivated as the second operational Osprey squadron in the Marine Corps. 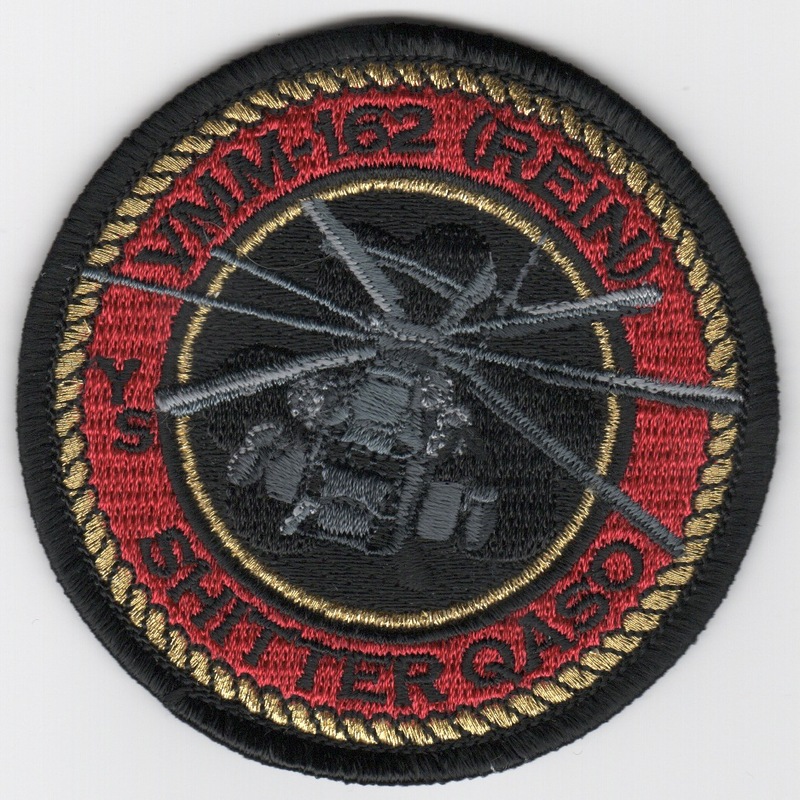 This is one (of nine) of their detachment patches created that says "SHITTER QASO" along the bottom, and does not comes with velcro attached. Marine Medium Tiltrotor Squadron 162 (VMM-162) is a United States Marine Corps tiltrotor squadron consisting of MV-22 Osprey transport aircraft. The squadron, known as the "Golden Eagles", is based at MCAS New River, NC and falls under the command of Marine Aircraft Group 26 (MAG-26) and the 2nd Marine Aircraft Wing (2nd MAW). HMM-162 officially stood down December 9, 2005 to begin the process of transitioning to the MV-22 Osprey. On August 31, 2006, the squadron was reactivated as the second operational Osprey squadron in the Marine Corps. 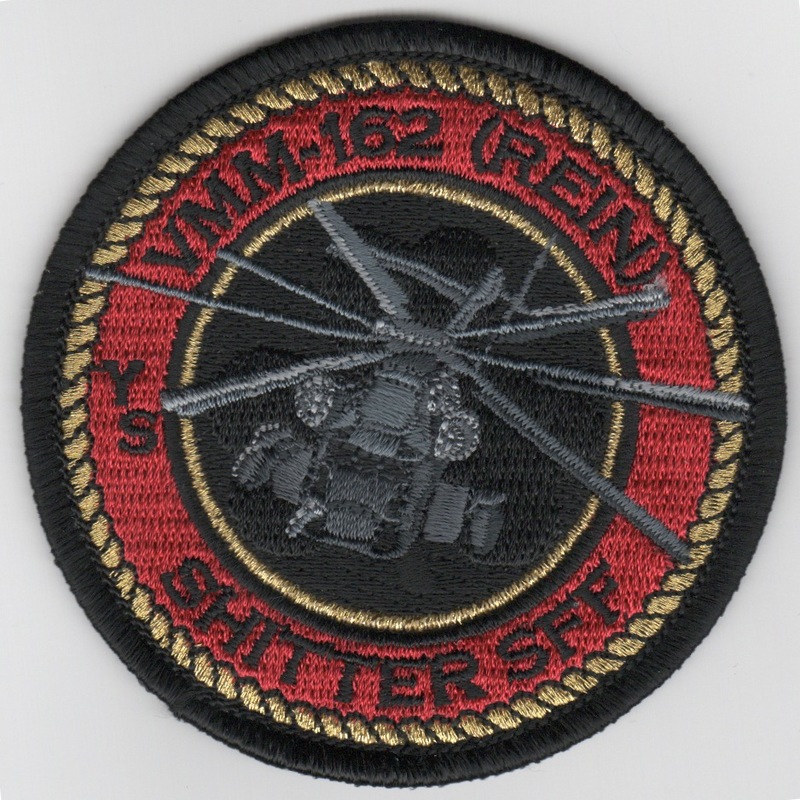 This is one (of nine) of their detachment patches created that says "SHITTER SFF" along the bottom, and does not comes with velcro attached. For squadron history, see above. Use this link to get all nine of their detachment patches created that says "SHITTER XXXX" along the bottom. These patches do not have velcro attached. Homepage | Order VMM-VMX Patches!